Asian markets are trading higher especially Nikkei jumped more than 1% following footsteps of Wall Street. 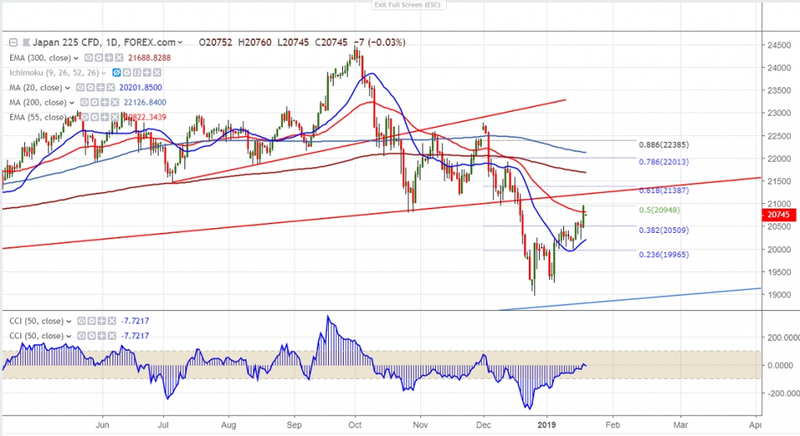 US markets end higher for 4th consecutive weeks on US-China trade hopes and jumped nearly more than 14% from low made on Dec 26th 2018.China’s GDP data came 6.6% in 2018 -slowest pace in 1990 but slightly in line with forecast.Dow Jones closed at 24706 (1.38% higher) and S&P500 2670 (1.32% higher) . Shanghai is trading slightly higher and is currently trading around 2614 (0.67% higher). Nikkei has jumped more than 450 points on Friday and is currently trading at 20750 (0.95% lower). USDJPY has halted its four days of continues jump and declined slightly on profit booking. The pair hits high of 109.88 and is currently trading around 109.63.The near term resistance is around 110and any break above targets 111.50/112..
On the lower side, near term support is around 20800 and any break below targets 20600/20200. The near term resistance is at 21000 and any break above targets 21387/21573. It is good to buy on dips around 20500 with SL around 20200 for the TP of 21380.